So…I have a rather summery treat for you today, even though we are definitely into the all things pumpkin and apple season. I’m sneaking one more taste of summer in as I look out my window at a grey sky and the leaves already starting to change. But don’t worry, these bars would work just as well with frozen berries, so they’re still a great treat even in the fall and winter months! Have you every gone blackberry picking? I don’t know how many places blackberries actually grow. I know they don’t grow where I live in Alberta, but they do grow on Vancouver Island where my in-laws live. Since we are lucky enough to head out to the island every summer for our family vacation, I have been introduced to picking blackberries over the last few years. Now, I’ll say first that I am no novice to berry picking. My grandparents had a huge garden with truckloads of raspberries, so growing up we went raspberry picking every year. I feel like I did a ton of raspberry picking (to which I’m sure my mother and aunts would all scoff and say that I actually did a ton of raspberry eating) but still – I’ve picked my fair share of berries. But I have learned that blackberry picking is nothing like raspberry picking. They’re both thorny plants, but my goodness, raspberry bushes aren’t dangerous. You get poked a bit, but it’s really not a big deal to force your way into the middle of the bush to get the good ones. Blackberry plants are out to get you. It’s like taking your life in your hands trying to get that juicy, beautiful berry in the middle of the bush. Heck, past the first leaf. The leaves even have thorns! How crazy is that? I swear I had thorns in every finger by the time I picked 2 1/2 cups of berries to make these bars. And I wasn’t even eating them while picking! Clearly I’ve gotten older and have more self control now – or I just couldn’t get to any more berries without losing a hand. We’ll go with the first one. 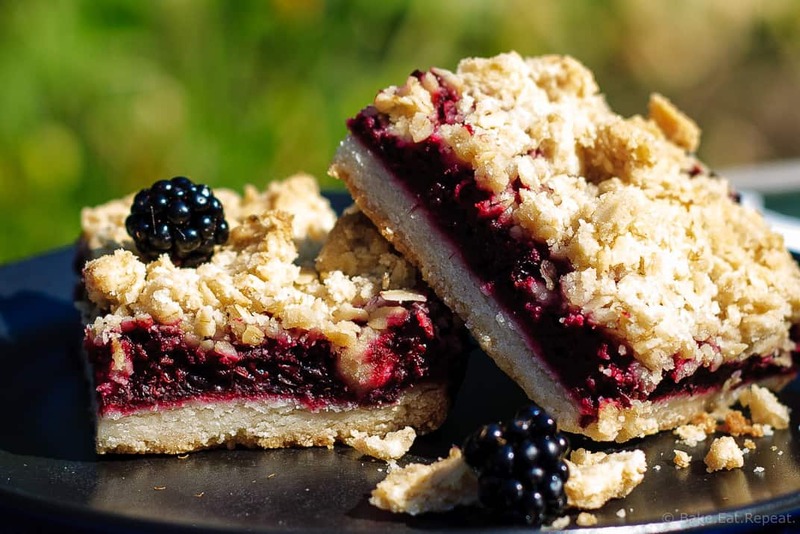 At any rate, totally worth it, because blackberry crumble bars made with blackberries that have just been picked may just be the best treat around. These bars were absolutely amazing. 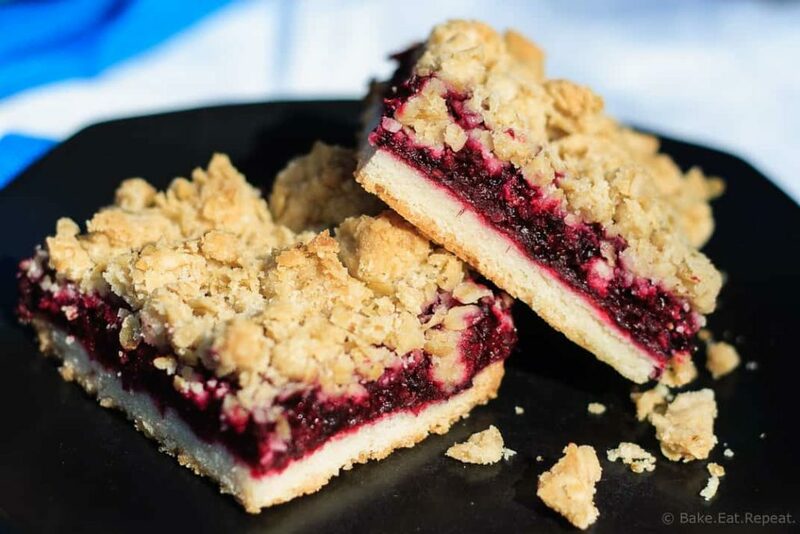 A crisp shortbread crust, and jammy blackberry filling, and a brown sugar and oatmeal crumble topping. They were fantastic. Pretty sure I’ll be taking my chances and picking more blackberries next summer, just so I can make these bars again. 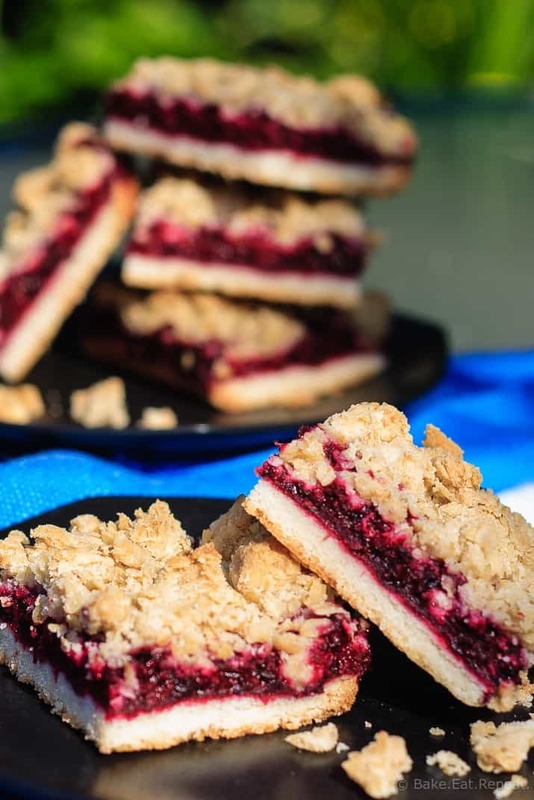 I’ve also shared this blackberry crumble bar recipe over on Food Fanatic so be sure to check it out over there! These bars look incredible, Stacey! 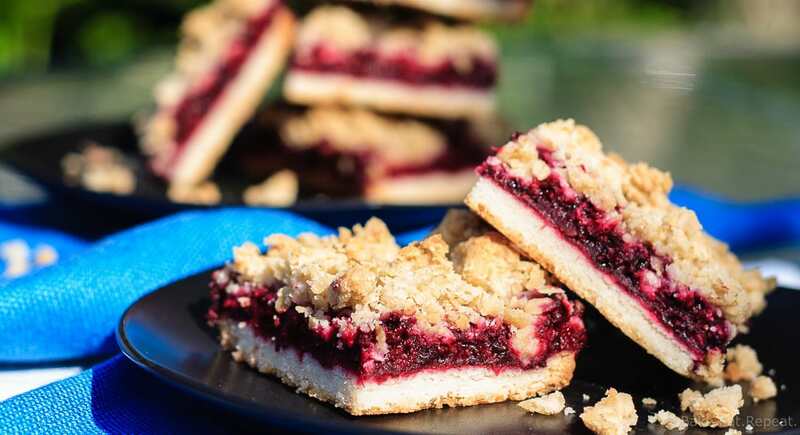 I made a raspberry crumb bar a few months ago, so now I totally need to try out your blackberry version. Love the pretty colors! They look terrific! We tried a similar bar, but I doubt it turned out as well as yours. Using blackberries switches up the flavor too. Thanks for the great idea! The bars look amazing Stacey! It has started to get cold here, so I am going to look at these bars and pretend it's still summer! That always works right? It's gotten fairly cold here this week too, but is supposed to warm up a bit next week so I'm hoping! Thanks Manali! What amazing looking crumble bars! They are so full of fruity deliciousness....yum! Leave it to you to go extreme blackberry picking, Stacey! I guess there's no other way to do it if you want to pick your own. I'm nowhere near as brave, so yep, the grocery store it will be. But you're right about it being worth it. I am in LOVE with all crumble bars, and these look especially crumbly! Hahaha, extreme blackberry picking. Not quite, I am just always surprised at how ridiculously thorny those plants are! Thanks Mir! Mmmm, blackberry jam is amazing, I never have enough berries to make any though. I always think of my Grandma when I make raspberry jam though, because she would make a ton of it every year. Thanks Ashlyn! Yum! What a great idea for an end of summer dessert! Love how packed full of blackberries these delicious looking bars are, Stacey! These look awesome! I love blackberries, we even have some little blackberry plants growing in our yard! Lucky! We love blackberries, but can't grow them here, and they cost an arm and a leg to buy! Oh well, just get my fill every summer when I'm on the Island! I wish we had blackberry bushes near us to pick… or maybe not after hearing both leaves and branches have thorns?! The kids would totally bail on me and I'd be forced to pick them all. But if it make these beautiful bars, then it's totally worth it! Yeah that's pretty much how it went - the kids were all excited at first, until they got stabbed by a thorn. Then they watched me! Worth it though, so tasty! Thanks Laura! Oh wow! Those look so amazing! Fruit tastes so good in desserts!